My instant reaction was similar to that of a woman who just got to know Bill gates was her father in law. Complementary coupons and offers - These are the best way to increase your sale, targeting your present customers. Think about what the customer is purchasing and what more can you offer in relevance to the purchase being made. For example if a customer is purchasing a laptop, complementary offers may include a genuine antivirus software or laptop cleaning toolkit. Additional freebies at lesser prices are a great way to attract the customer resulting in better sales. Loyalty benefits - Loyalty benefits are a must to increase your count of customers. Online stores profit a lot by this method. Ask your customers to sign up and make all purchases through their accounts offering them in return benefits and points which they can redeem and turn into actual discounts. This loyalty program buys you more customers and ensures their loyalty actually. Discount coupon codes - Discount coupon codes are a great way to market your brand and increase sales. 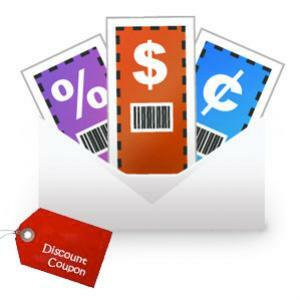 You can promote discount coupons in many ways such as e-mails, social media sites, blogs etc. Always target a particular audience or belt of customers with your discount coupons. Free shipping - A must, free shipping offers or discounts on shipping act as a great facility to your customers who get everything served to them on a plate by just a simple click. Imagine their delight if all this is done in zero or minimal costs. No extra charges apart from the price of the product actually have a good hold on people. First time buyer offers and benefits - This is a sure shot new way to attract more customers to your store. Add benefits and offers specially for the newcomers welcoming them as a part of your family. It will work wonders. Out of so many options, your welcoming offer will be the prime reason for customer choosing your store to make a purchase and result in a hike in your sales. Festival bash - Festivals can be used as festive season for the market and stores because this is the time when people get crazy and obsessed with shopping. Use this business strategy well and announce bang on festival offers and discounts that will direct the stream of customers to your channel. Be a family - A sweet and sure way of winning the hearts and vote banks of your customers is to make it personal and go deeper than the buyer-seller relationship. Make use of the customer details and give it a personal touch. Drop in an e-card and an offer on their special day, inviting them to have a happy discounted shop. Guess their delight on being treated special on their special day. I would definitely buy a birthday gift for myself if offered a warm tempting discount! Themed Discounts - Festive season or no festive season, you have to always firmly grip your customers’ belt. So spice in their shopping every now and then. Introduce themed discounts of your choice, wedding sales, winter sales, mother's day or simply every day deal. One can go on and on. Offline to Online - Many a times, you can lose out on those customers who are not purchasing things online. Well this is the best way to bank them in. Introduce offers and discount coupons on online orders. You might also be some shop that does not offer online sale - such as restaurants or hotels, but still have an active online commercial website. Even though you do not actually offer products for direct sale but you still can offer services at discounts. For example, restaurants can place discounts on online bookings and reservations. All that the customer has to do is present the reservation mail or coupon sent to him online. You will see the wonders. The other day I read in a pamphlet, 20% discount on placing order online. I remember ordering products from the store online ever since, even though their outlet was very near to my residence. This is the real way to market yourselves, get your customers to do it for you. You can use the social media as the platform for marketing your brand via your customers. Sharing links on Facebook, liking your page, tweeting about an event or product, inviting friends to like your page, all of this marketing can be done free of cost by just offering some benefits to your consumer in return . Get them to write reviews for your product or service. Reviews are a very important factor in influencing your prospective customers. Place incentives or benefit for opening an account and writing genuine reviews about the products. This way you turn your own customers into your advertisers and get a better reach in their circles. Plus you will expand your customer belt tremendously. Coupons are any day a better deal for your business. They help you track down your customers and their shopping habit, helping you to understand them better, offer them what they need and increase your sales. Always remember to limit their validity and increase a sense of hurry in your consumers. This will also help you to control and manage your coupons so that no shortage or overnight scarcity occurs. Bind the discounts or coupons with particular products and keep the count of people using those coupons. In total, use the discount scheme well to make big profits at a small price and expand your wings in the market.